Have you ever wanted to send someone a secret message that can self-destruct in a specific timeline? We all know how hard it is to delete messages one by one on all the other popular chatting platforms out there. It is a very time consuming process, and you end up spending more time deleting the message rather than typing it. 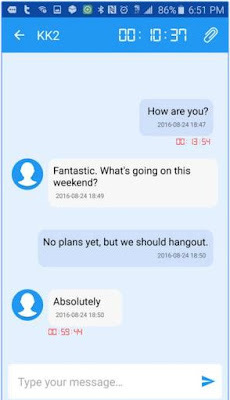 Well there’s an app out there that allows you to send secret private messages to other people that self-destruct after a given time. The SpyChatter app is a brand new chat app that is being developed by an app company called Level 9. With this app, you can send secret messages, pictures, videos and files and set a self-destruct timer on them.All you have to do is type out your message, or attach your file, hold the chat bubble and select the timeline for self-destruction. You can select hours, minutes or seconds. After you select the deletion timer, you can just sit back and relax because the app will do the rest of the work for you. The app leaves no trace left behind after the timer runs out. This makes the app great for keeping secret information private. If you are further interested in the app, you can find and download the app from Google Play.